Whew. I am exhausted. Mind you I don’t have much to be exhausted about. Other than that pesky getting the house ready to sell thing which aside from being a lot of work is a tad bit emotional. I love our animal friends that come to visit our yard. I love our neighbors even if their yard always looks a bazillion times better than ours. I love finding treasures when I clean out the closets that are filled to the max. 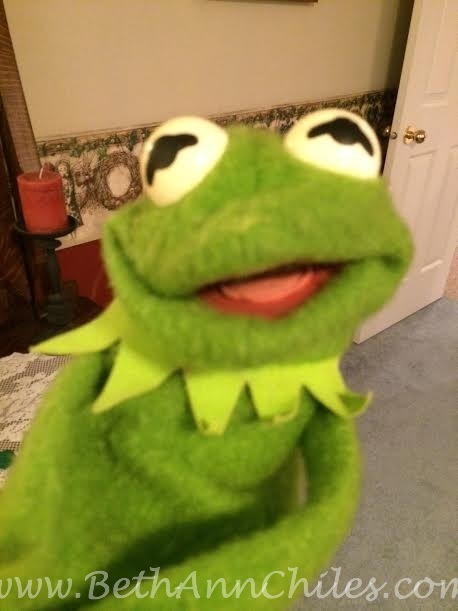 Kermit held my engagement ring in the top of his head! 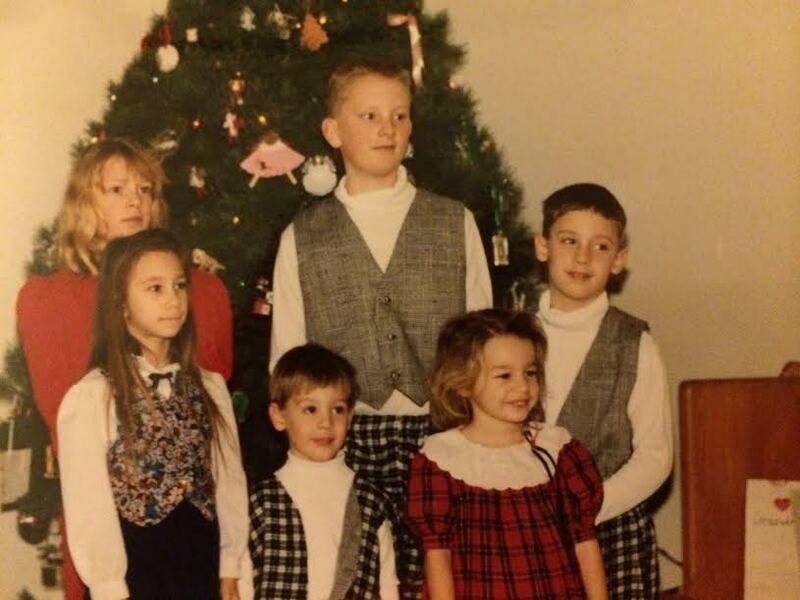 I could very easily get lost sorting through old pictures and reliving memories of years gone by. I also finished up another 100 cards to take to Hospice this week so that took a bit of my time. Of course I had a huge mess in my office and got called twice to show the house. I like to have a bit of notice and I managed pretty well both times on a couple hours but non-crafters can’t possibly understand the disaster zone that can occur when “creative minds” are working. To date I have made 525 cards for Hospice of North Iowa–all since October. No two have been alike as far as I know. Next week I am hosting a little soiree with the local bloggers. A taste testing party which of course, you, my dear readers, will get to read all about later on in the week. It is going to be a fabulous diversion from what I have been doing and will give me something else to look forward to other than Mr. Diamond coming home in a couple of weeks. So tell me—what have you been up to??? Don’t forget Comments for a Cause results and reveal tomorrow!!!! Ya’ll come back now, ya hear? Hang in there. It will all be worth it soon. Best of luck in selling your house. I am cleaning the basement which stores many treasures that are only treasured by us ~ by me in general ~ all my sons scribblings, old photos and diaries and stories written in notebooks. It’s a cryfest here for me as time flies! What a busy, stressful, exciting time. My dining room table is my project table – ugh! Your baking/treats are a sweet touch. Oh I used to use the dining room table in the other houses! This house I have my very own office/room so i can mess it up to my hearts content and just close the door! You aren’t busy or anything, are you? Baking, cleaning, crafting…missing Mr. Diamond. I’ve been working on basement demo, scraping carpet backing, with a narrow putty knife, from the floor. Fun times. I am going through some things but not because I am moving. I just want to get rid of stuff. Yesterday I found some interesting things your Dad had saved and am saving them for my children to read. They are very interesting. Have you planted a St. Joseph statue in the yard yet? I know you’re not Catholic, but I understand he’s a nondenominational helper in selling houses! You’re my hero, Beth Ann. How you ever manage to pack SO MUCH into one day’s time is simply amazing. No wonder you’re tired!! I’m sneaking my comment in under the wire I fear. I’d come and look at your house just to taste those goodies you baked. And I think you’re on to something there. The most powerful memories we have are linked to smell. You’re leaving potential buyers with a major way to remember your house! The comment counts!!!!! Yes— the sense of smell is an incredible thing…. 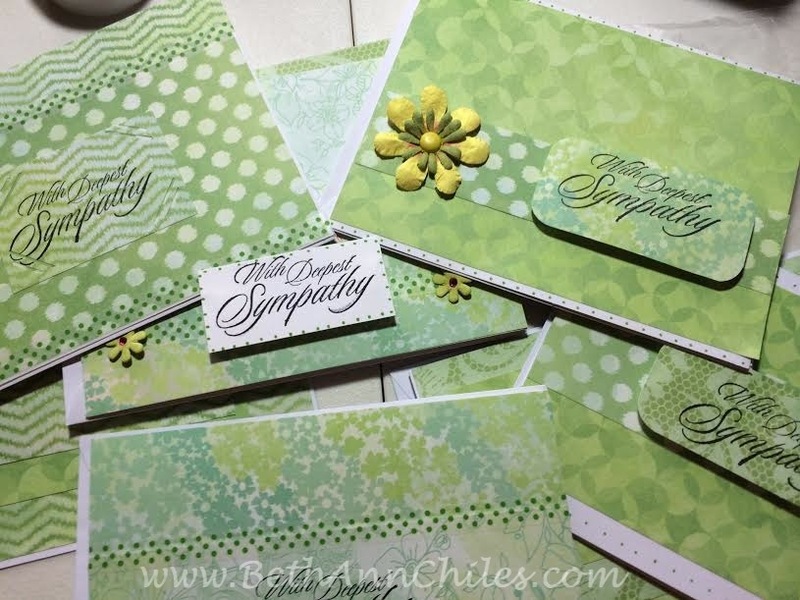 The cards are beautiful Beth Ann – doing those cards for hospice is a wonderful thing. Baking when you have potential buyers coming by is a great idea. Hubby and I several years ago stopped by an open house and upon opening the door was greeted by this wonderful smell of cookies baking! Yes, we always remembered that house!! Great idea…and by the way…you’re getting the “Texas” slang down pretty good! You and I are doing much the same thing. Finding treasures, baking, cleaning up at the last minute etc. I also had a book launch and had to fly back home twice this month to see mom as her health is failing. It has been stressful to say the least bit I managed to get to the beach twice this week and chill which helped. Hang in there. The right people will come along and love your house as much as you do! I know you are right and I am actually expecting it to take quite awhile. I just am not sleeping well and that adds to it, doesn’t it?? It’s all good. I had bunch of seagulls fly over our house tonight so I think that is my personal beach experience. 🙂 You have had quite a month, haven’t you? Life is good—gotta love being busy! I sent those seagulls your way! I’m glad they did the trick. Awwww it will be a wonderful reunion. We’ve been there prior to living where we do now. Hubby was gone three weeks and home for one but his time home he was soo exhausted. He would work 13 hours and straight from work drive 13 hours home. It was brutal. It definitely helps! Makes you appreciate some things more too. 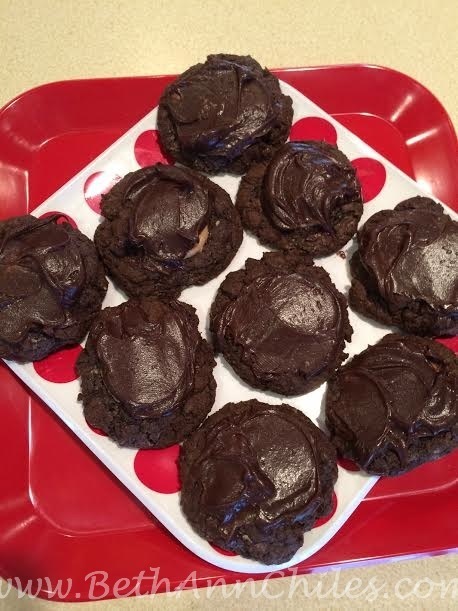 Banana bread and Buckeye Brownie Cookies? I think I need to come take a look at your house. How nice of you to leave those delicious goodies for the peeps that look at your house! Moving is a roller coaster of emotions. I have my fingers crossed for a sale. I am thinking this month will be it. We have been spending lots of time in our vehicles traveling to St. Louis and Kansas City. Family stuff.. fun family stuff. I am ready to stay home for a bit! Can you believe it is August 1? Dang. And I will miss the blogger fun… I will be checking the event out on Social Media, of course! We will definitely miss you, Sara, but yes—-i am sure there will be some tweeting going on!!!! Have a great trip!!! We will be looking for your sharing, too! Rabbit. Rabbit. It’s a lot of work AND you are turning it all into an adventure. I love that. The tasting party sounds like my cuppa so take plenty of tastes for me. I have fat finger syndrome every day!!! Especially on my phone….. Thanks so much for stopping by and taking the time to comment!!! 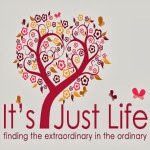 I love meeting new folks and am thrilled to welcome you to It’s Just Life!!! Thanks! I have a lot of fun making them and am always looking for new ideas. 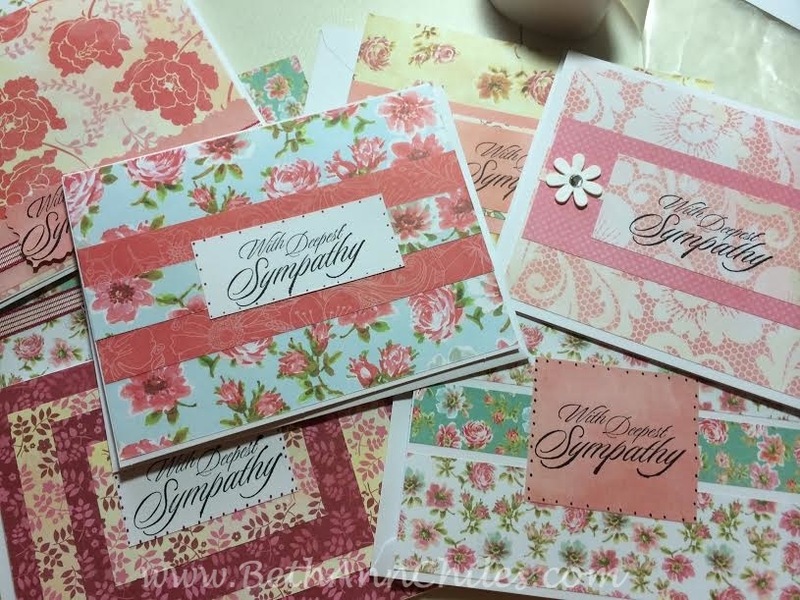 The hospice ones are all the same basic message but with different papers and embellishments. 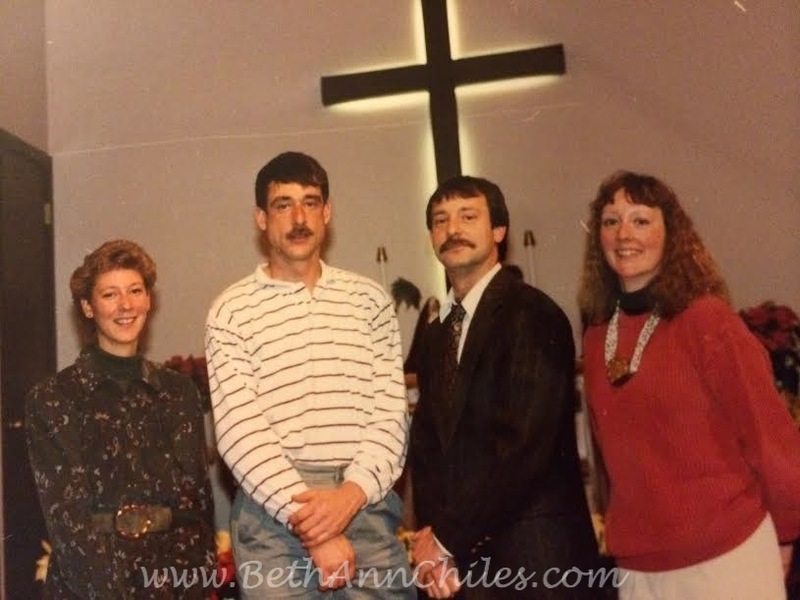 Wow, Beth Ann! I was just reading your blog and it is ‘chucked full’ of great stuff! No wonder you’re so much fun to talk to on Tuesday mornings! I think you’re just kicked into high gear in the creativity mode…love your beautiful cards! 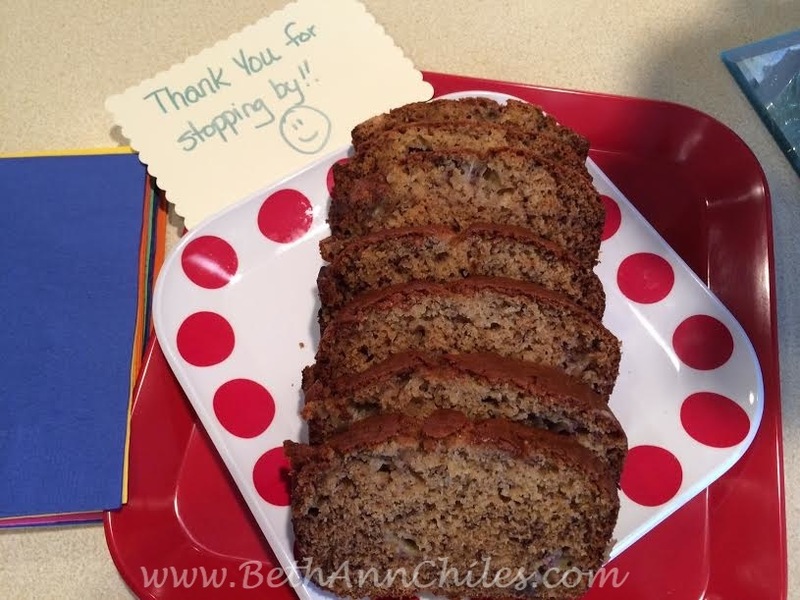 And the yummy treats…who does that when selling a house?? Awesome! You are one talented, benevolent and fun gal…keep up the good work in all things! Thanks, Cynthia!!! You rock, too, in my book. We can start a mutual admiration club. 🙂 Seriously—-I have had so much fun on Tuesday mornings!!! !Wish I had met you years ago!!! We will make up for it now! I used to work as a secretary in a real estate office & a trick some of the realtors used to use was to bake an apple (with cinnamon of course) on low heat while the house showing was going on because it makes the house smell like a home. Exactly! I have always done something like that also but so far it has not worked —-no sale. 🙂 It will take time.